U.S. and international special operations leaders gathered on March 5-7, 2019 for an exclusive event to focus on strategic security issues, innovation, and relationship-building. Save the Date! Next year's event is March 4-6, 2020! "I had more meaningful conversations with both government and industry than any other conference in the last few years." "I attend a lot of these events, and yours was among the best... I believe your organization will prove to be one of SOF's most useful tools to both its members and the Command(s)." "A really great symposium -- better than last year, which means it will improve each year!" 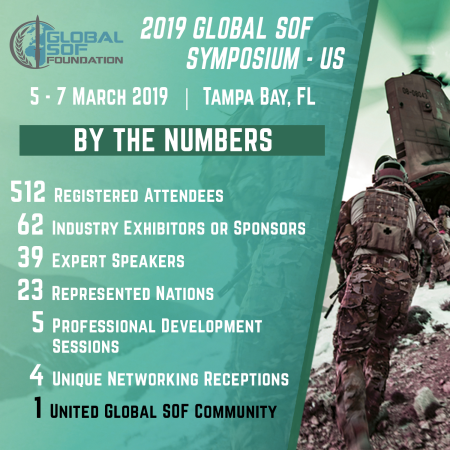 Sign up below and receive updates about the 2020 Global SOF Symposium - US.